At Beaumont Demolition, our demolition contractors look towards renewal. Foundational objects require this from time to time. Our team of demolition pros also offer services to remove old, damaged, and needing to be replaced pads, sidewalks, driveways, roads for communities in Beaumont, Port Arthur, Lake Charles, Nederland, Orange, Vidor, Lumberton, Sour Lake, China, and Silsbee, Texas and the surrounding areas. We wield our sledgehammers with the best of them. If you are in need of pad, sidewalk, driveway, and/or road removal, let us know! We service residences, businesses, and public entities and facilities, and at better rates than the competition. Pad foundations are critical parts of construction. Whether plain concrete, reinforced concrete, continuous, combined column, pad and ground beam combination, or other types of pad foundations, we at Beaumont Demolition can remove any type of decrepit pads. Pads serve as structural foundation. Removing them is necessary for any complete demolition job. It is unsafe to build on top of unreliable or damaged pads. Our team offers pad site removal and hauling services for both residential and commercial projects. Our affordable prices and quality of service best the competition. If you have structural pad concerns, give us a call so that we can work directly with you to assess your needs. Concrete is mostly recyclable these days, saving both you money and the environment at the same time. We haul away old concrete to be recycled whenever we can. Permits are offered required for sidewalk projects, but you need not worry. Our savvy team of demolition pros can handle all jurisdictional requirements. Your local demolition contractors are fully certified, licensed, and insured to remove old, cracked, and in need of replacement sidewalk. From start to finish, the process of sidewalk renewal takes around a week. Call us today for an assessment or estimate if you need sidewalk removal and hauling services. Driveways are underrated. People don’t spend much time thinking about driveways despite driving and parking their trusty automobiles on them everyday. At Beaumont Demolition, we think about driveways all the time and offer driveway demolition, removal, and hauling services. If you driveway is cracked or has settled concrete, call us today to remove your driveway and haul away and recycle the concrete. Our team of demo pros is made up of concrete experts with years of experience. We offer assessments and estimates before you need to pay for anything. Our team would like to make sure you have a reliable driveway, just as you have a reliable foundation for your home or business. We provide road and highway demolition, removal, and haul away services for our local communities all throughout Texas. We know concrete and asphalt. Our services are offered to commercial and governmental agencies. Whether for public roads, private roads, or roads inside government, business, or industrial complexes, Beaumont Demolition is the local company for the job. 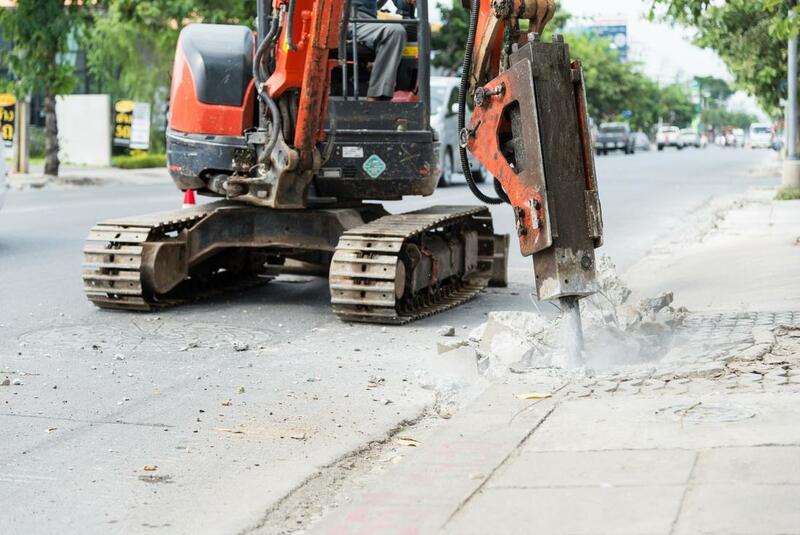 Our team of certified, professional demo pros can jackhammer away any road and haul away the concrete and asphalt more quickly than anyone else in the state. Roads are essential to our society, so we have a vested interest in not only removing and hauling away decrepit road, but also doing it quickly so new road can be placed.